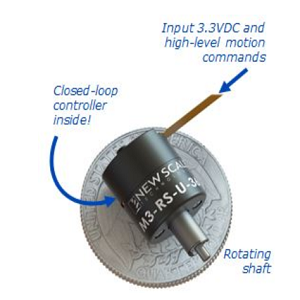 The M3-RS-U-360 Rotary Stage positioning module is a miniature “all-in-one” rotary positioning stage with built-in controller. The precision smart stage with embedded controller inside is only 12 mm diameter x 12.5 mm tall. It operates on battery power and is ideal for use in miniature instruments and handheld devices. The piezoelectric stage provides continuous 360° rotation with absolute position feedback. Patented piezoelectric motors along with position sensors, bearings, drive electronics and embedded firmware are all integrated into this rotary micro stage. The embedded controller in the micro stage gives you the smallest system size — no need for an external controller. It also makes for fast, easy integration into your system. The smart stage accepts direct input of high-level digital motion commands from your system processor over UART, SPI, I2C or analog servo interface. Developer’s kits include a USB adapter for PC control, and New Scale Pathway™ software. The M3-RS-U Rotary Stage positioning module needs only 3.3 V DC and uses approximately 500 mW when moving. It can be powered by USB or standard batteries. The integrated piezo motor holds position without using power.